a dramatic cloud formation pinned against the sky; a flower portrait at once sculptural and ethereal; a table that evokes the spirit of the wood from which it emerged; the shimmering functionality of a micaceous clay pot; the luster and patina in the marriage of wax and rust; the lush geometry of light portrayed in a shower of sunlight; the wild stillness of birds on a branch; the contained fire radiating from a ceramic sculpture; the watchfulness embedded in a closely observed landscape. These artists understand what it means to be of this world, to be comfortable with the materials and methods they have chosen, and to be greedy for their own moments of alchemy. Each in their own different ways, these artists live inside light, wood, wax, and fire. 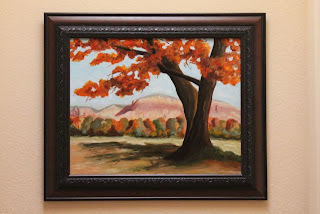 The exhibition runs from November 10 through December 8, 2012 in The La Tienda Exhibit Space at Eldorado, Santa Fe. Gallery hours: 11 am to 5 pm, Wednesday through Saturday. Show runs through November 3. 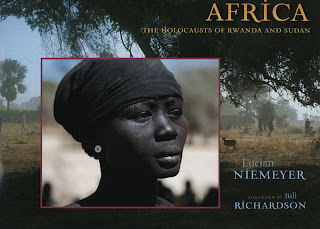 Africa, The Holocausts of Rwanda and Sudan is a color photographic essay with a text by Lucian Niemeyer. 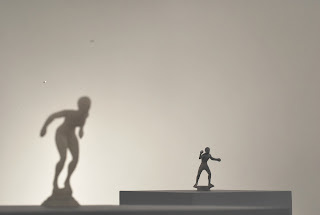 The exhibit first appeared at The Delaware Art Museum in Wilmington, Delaware. The exhibit has since appeared in many other venues with the last being at the Maxwell Museum at the University of New Mexico, where over 160 images were displayed over a year. A book by the same name was published by The University of New Mexico Press in 2005. It was followed by the book Darfur in 2007. The book Africa was nominated by the University for a Pulitzer Prize. Though it did not win, a copy of the book was given to every United States Senator by a foundation in Virginia. A group show of the work of five artists takes place at La Tienda in Eldorado, New Mexico, June 30-July 21, 2012. The artists, Jan Alsever, Beverley Crane, Charlotte D’Aigle, MKHargrove, and Gerry Perrin, live and work in Santa Fe County. 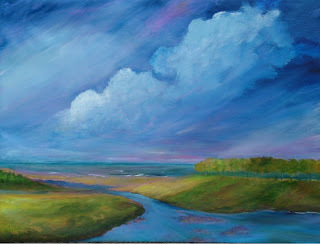 Their artistic expressions capture a sense of earth, sky and place. 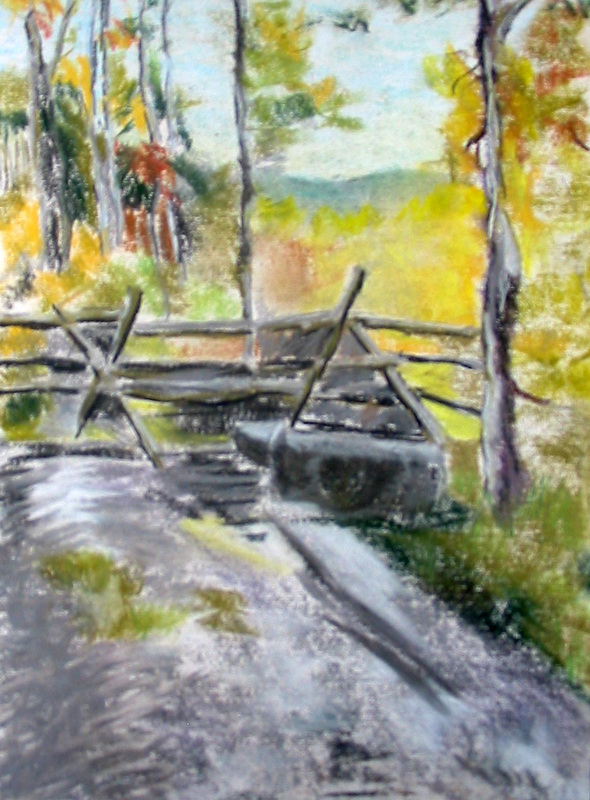 Working in various mediums and styles, they share an art focus on the land and their feelings for it. Four are painters and one is a sculptor. All are devoted to creativity and artistic challenge. MK HARGROVE says, “Hovering above the earth is the most magnificent and constantly changing work of art—the sky! It is there for us to view and appreciate every day. Many times, people don’t even notice it. 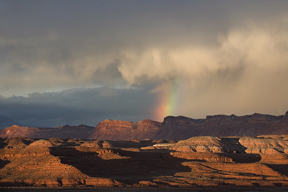 Sometimes, even landscape painters take it for granted. My art is about the sky. 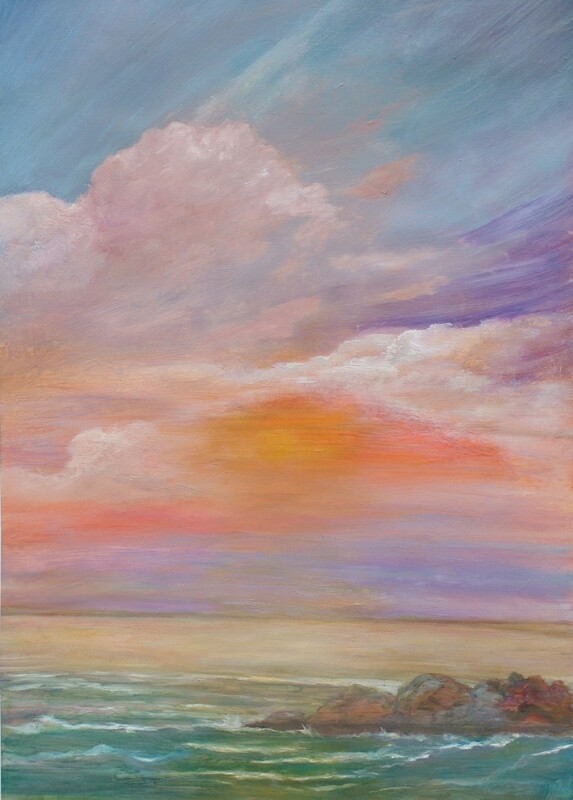 My goal is that my paintings jog the viewers’ senses a little and remind them to look up more often to stop—and be awestruck! From the sky above us comes light and the atmosphere, and these make the shade possible. Is a landscape a landscape without these? 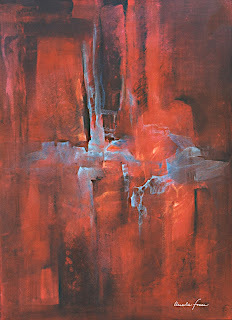 Oh, but there is more to come…abstraction! The Enchanted Landscape Group Show will open with an artists’ reception Saturday, June 30th, 5-7 p.m. The show can then be viewed Wednesday through Saturday, 11-6 p.m. at La Tienda Exhibit Space. For more information regarding La Tienda: (505) 428-0024. The weekend's celebration begins on Friday, May 18 with a gala Opening Night reception in the Exhibit Space at La Tienda at Eldorado, 7 Caliente Road, Suite A-6 from 5-7:00 pm. It's an opportunity to meet with the artists, view their work and enjoy refreshments. Live music will be performed by Master guitarist David Wescott Yard and keyboardist Doug Frantz. 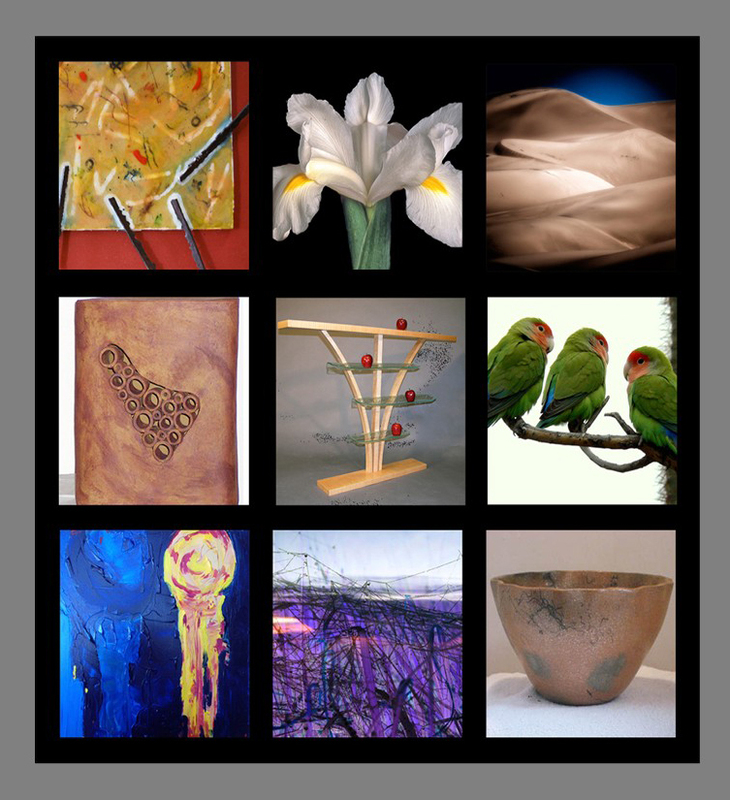 69 studios showcasing the work of 106 artists will be open to the public on Saturday and Sunday from 10am-5pm. The Preview Gallery will be open on both days from 9am-5pm. There you can gather brochures and maps to plan your studio visits. The quilt show, “Metamorphosis,” opens March 17 and runs through April 14 at La Tienda in Eldorado. The show features the work of 20 local artists along with several heirloom quilts from the late 1800s, the 1930s, and the 1950s. “By showing the old quilts, we hope that viewers will understand the evolution of quilting styles and the changing fabrics, batting, thread, and colors that were used,” says Jean Stokes, the show’s organizer. In addition to this show, events are planned to bring more awareness to this long-time art form. Quilters included in the exhibit are Gale Oppenheimer-Pietrzak, Donna Barnits, Mary Ann Onstott, Jean Stokes, Nell Riley Stokes, and Isabel Mooney. Complementing the quilts at the show are the works of painters, weavers, photographers, and glass artists. These artists include Jack Arnold, Sally Hayden, Lynne Coyle, Connie Soring, Braldt Bralds, and Margaret Braldt. 1:30 pm: The Quilters, a play directed by Charles De Muth. A quilt by his great, great, grandmother is among the props. Performed by Dottie Hill, Patti Blair, Betsy Alden Robinson, and Dorothy Rogers. La Tienda Performance Space. $5 donation, children free. 1:30 pm: Isabel Mooney and her vibrant quilts. 2:30 pm: “New Mexico Historical Centennial Textiles.” Exhibit and presentation by Colleen Konetzni and Donna Barnitz. La Tienda Performance Space. $5 donation, children free. 1:30 pm: “Somewhere in Ireland”: Poetry reading, book signing, and quilt display by Linda Whittenberg, accompanied by Danny Wilding on flute. La Tienda, Building B, Eldorado Community Church. Free. 1:30 pm: The Quilters play, second performance. 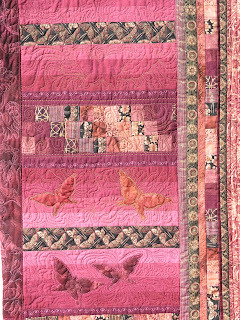 2:30 pm: “Sharing Family Heirlooms”: People can bring their old family quilts for discussion. Comments by Nora Pickens, M.A, textile historian. La Tienda Exhibit Space. Free. 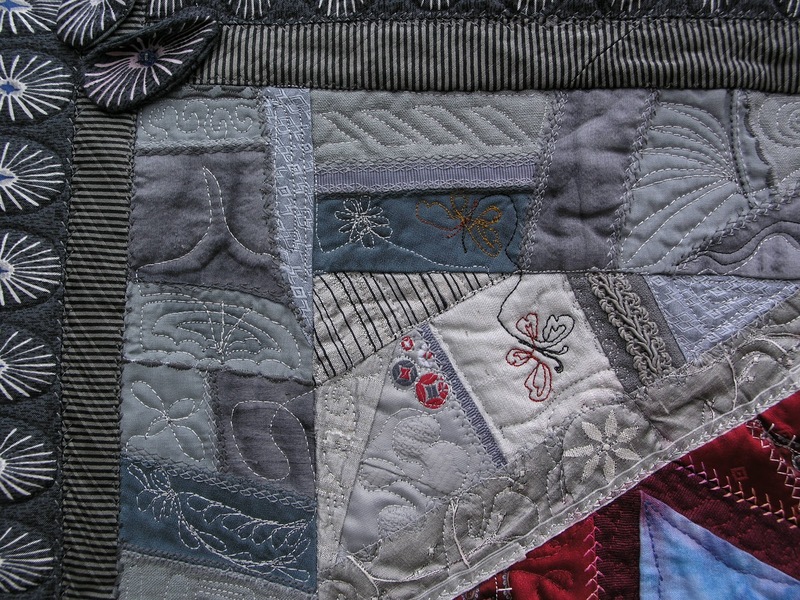 6:30 pm: “Thinking about Quilts as Art”: A discussion with art teachers and notable quilters. Jeri Beitel, M.A., art historian, and Rhae Burden, MFA, former College of Santa Fe Gallery director. La Tienda Exhibit Space. Free. Display of completed Eldorado/285 Centennial Friendship Quilt. Eldorado photographers exhibit in La Tienda Building A. 1:30 pm: Discussion of photo-to-fabric process by Judy McGowan, photographer, quilter, former county planning manager. La Tienda Exhibit Space. Free. 4:30: Finale including music, readings, and treats from Mi Amor Chocolate. La Tienda Exhibit Space. Free. in El Dorado on February 18th and continues through March 11. Opening reception from 5-7. The five artists represented are: Thayer Carter, Andrew Davis, Geraldine Fiskus, Dee Homans and J. Barry Zeiger. For further information call Dee Homans at 982-0501 or the Exhibit Space at la Tienda at 428-0024. To see a review of the show, click here. "Safety in numbers; Art before Alzheimer’s. "Emerging—or Submerging? Emerging is the quality par excellence of our present, a stepping out into the hard glitter of celebrity. In contrast, submerging is a thirst for ambiguity and depth. In any case here are 5 "submerging" artists. Each one has invented a vehicle to probe the depths of the concepts and issues that inspire them. They inspect the hidden wreckage of history; the lost things, the detritus of our lives; the hidden and forgotten beauty of the natural world; the vestigial meaning of language; and the humor and horror of primordial, vital form." Thayer Carter works in a variety of media including oil, acrylic, water colors, and woodcuts. His focus is on the earth, on landscape, but also on things seen up close. Assiduously avoiding romance and pasted-on ideas, he submerges himself in what he sees. 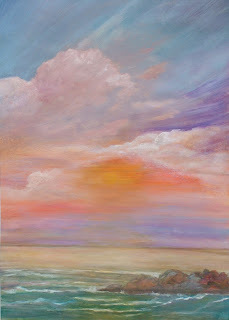 His paintings place us here, our feet firmly planted. Out of curiosity or restlessness, Andrew Davis has also experimented in a number of media: the printed page, wood, steel, concrete, the photographic image, but his subjects have always been the same: the nature of language, the cohabitation of people and objects, above all the relationship of words with things. In her self portraits Geraldine Fiskus re-invents herself through performance. Sometimes she sees herself during the calm of meditation—the cloud forms above her head symbolize distractions. Earlier portraits reveal uncomfortable, disquieting experience. These facescapes display the raw edge which most of us avoid. The fiberglass sculptures of Dee Homans suggest, but do not represent, bodies. They are a tangle of shapes wrenching themselves into the form of a tower, or a swarm clinging together in mid-air, or a gust across a wall. Homans sees her work as tragic-comic: "It is at once prosaic and Baroque, grand and playful, inanimate and alive, apocalyptic and hopeful." J. Barry Zeiger has developed an object based language. By situating objects he creates contexts for ideas. He groups them into unexpected relationships--merging and submerging their identities to suggest ephemeralness. He notes, "We give such importance to things, while they just keep dissolving." Please join us on Saturday, January 28 from 5 to 7 pm for our first auction in support of the Exhibit Space. 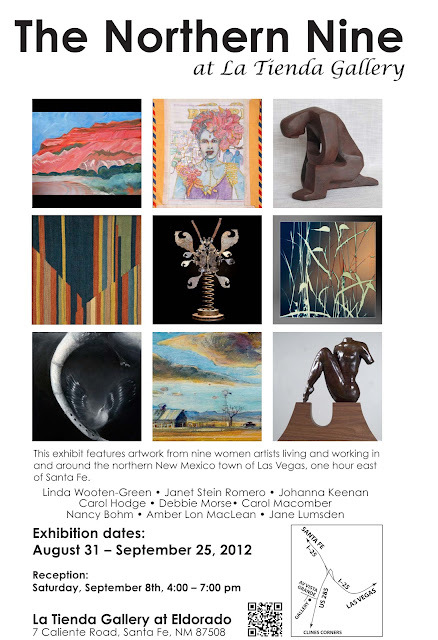 As most of you know, the La Tienda Exhibit Space is a professional gallery space that exists to promote economic and educational opportunities for New Mexico artists. Artists do not pay for the use of the space and they keep 100% of their sales. On Saturday, more than 40 artworks will be sold during a silent auction. The artworks were donated by artists and community members who have benefited from the Exhibit Space so that the Exhibit Space can continue to provide this invaluable resource to the community. Proceeds from the auction will go toward continuing to provide a free ad for every show this year. Artworks have extremely low minimum bids (and when we say low, we mean low)! Did you fancy one of Braldt Bralds' prints when he exhibited here last year? 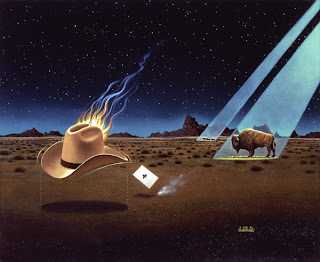 How about one of Rick Alt's incredible landscapes, or Thom Ross' contemporary western art? Please come out in support of the artists who live and work here, and in support of the La Tienda Exhibit Space and help us continue to provide this resource.